It is very easy for home owners and businesses to take plumbing systems for granted. Many expect to turn on the water in the kitchen or bathroom and expect the water to flow quickly. In most occasions it does but there is that one time when it starts to flow slowly. At times, you have to use a plunger or pour down hot water in the drain pipes in hopes of removing what’s blocking the drain pipe. At Smith Plumbing, we highly advice our customers against using hot water in order to unblock a drain pipe. Not only will it cause further damage to the drain pipe system but it will escalate the repair and replacement costs altogether. Our experience with clogged drain pipes has taught us that the cause may be due to the following – grease, fats, oils, debris, dirt, soaps and hair. They do collect and harden along the pipes. In a few months the mass increases in size blocking the pipe partially or fully. This is why Smith Plumbing advocates for hydro jetting pipe cleaning in Topeka. What is Hydro Jetting Pipe Cleaning? This is a drain pipe cleaning method that uses streams of water pumped at extremely high pressure of between 7,000 PSI to 60,000 PSI. 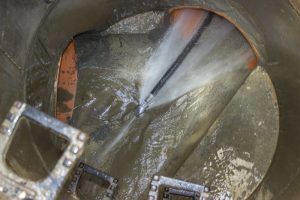 The streams of high pressured water help to remove grime that has hardened and built up along the wall of the drain pipe resulting in clogging. Hydro jetting pipe cleaning in Topeka is the most powerful and effective form of power washing that has gained popularity as a means of ensuring a clean drain pipe. The equipment used is composed of a water tank, an engine, a pump, a hose reel and a hose with several nozzles at the end. How does Hydro Jetting Pipe Cleaning in Topeka Work? When you contact Smith Plumbing call center, experts will arrive with a mobile truck attached with the hydro jetting equipment on a small trailer at the back. The hydro jetting equipment is composed of a water tank, a hose reel, an engine and a hose fitted with several nozzles at the end. The hose with the nozzle is available for different pipe sizes. It is common to find a 1.5 inch, 2 inch, 3 inch, 4 inch, 6 inch and 8 inch sizes. When the experts arrive at your home, they will first diagnose the problem. They will try to use the snake in order to remove what is blocking the drain pipe. While it will help to remove what is blocking the drain pipe, this is not enough. There are still left over’s of the mass in the drain pipe and if not removed, they will amass again and block the pipe. This is where Smith Plumbing hydro jetting pipe cleaning in Topeka comes in. Once the problem has been identified, the hose with the nozzles on one end is put into the drain pipe from one end. Once the pump is started, high pressurized water is released into the hose which comes out on the other end inform of jets. Due to the high pressured streams of water, dirt is easily removed from the sides. Our services are of high quality and waste water should be flowing well after the process. Drain pipes can clog when neglect steps in. It is common to find home owners throwing all manner of elements down the drain pipe. While waste water may flow well, the elements will be lodged down the drain pipe somewhere. With time, they will collect other elements. The mass will harden and result in clogging. With hydro jetting pipe cleaning services in Topeka, the clogging mass is removed easily thanks to high pressured water jets. They help to dislodge the grime that sticks to the side of the drain pipe preventing any clogging. Today, home owners research on the internet for solutions to a problem they are facing. It is common to find DIY methods which are supposed to resolve plumbing problems. When home owners are faced with clogged drain problems, they usually resort to chemical cleaning and use of hot water. What many don’t know is that the chemicals and hot water will cause damage to the drain pipe. This will escalate the repairs and replacement to the drain pipe. With hydro jetting pipe cleaning in Topeka, home owners are guaranteed of no damage to the drain pipe. Even though water is pumped at a very high pressure, the pipes will not be damaged. Only grime will be removed leaving the drain pipes grime free. Can Clean Over 200 Feet of Drain Pipe at a Given Time? Yes, hydro jetting pipe cleaning services in Topeka is able to clean 200 feet of drain pipe at any given time. What this means is that if you own a large building, Smith Plumbing experts are prepared to clean the drain pipes assuring you of fast flow rates for waste water. Furthermore, no abrasive or corrosive chemicals are used. The procedure completely removes accumulated grease, grime, dirt and mineral deposits which are known to build up over several months. At Smith Plumbing, our goal is not only to provide you with high quality and timely services but we aim to provide affordable services too. This is why we advocate hydro jetting pipe cleaning in Topeka. Our equipment is capable of handling any clog and to ensure that no water overflow occurs; precautions are often put in place. Call Smith Plumbing today and begin enjoying a trouble free drain pipe.